We’re all looking for something that will build confidence, strength, life skills and accountability for our young ladies. We want a place where they feel safe and encouraged to be active. We also want them to live a better, more empowered life than we did. 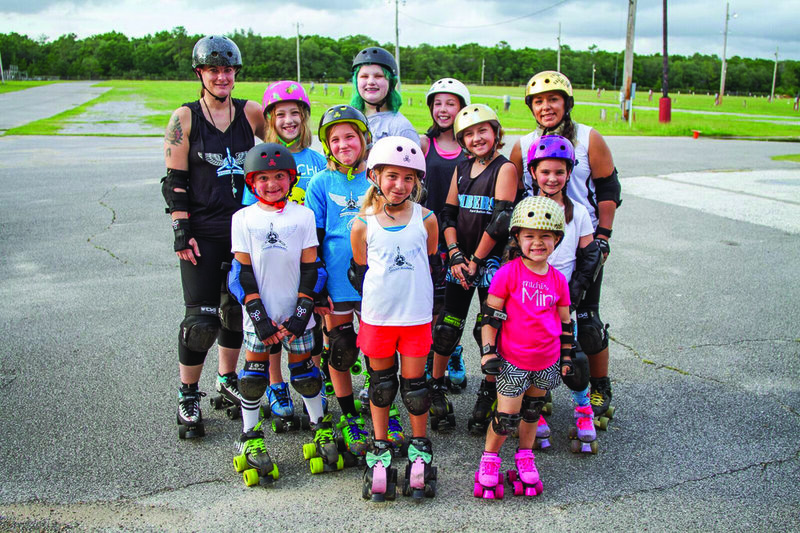 If you nodded along and agreed with the above, read more to learn a little about what makes the Fort Walton Beach Junior Bombers Roller Derby team an ideal environment for your daughter(s). 40s something, Nicci Starks Lee has been skating for over six years as part of the local roller derby team for adults. When talking about what drew her to roller derby, Nicci explained that roller derby is about more than just skating and playing a game. It’s about providing and being provided with a community and support system. She said that roller derby calmed her down and gave her a much needed outlet while also helping to change her perspective on things that just didn’t need her energy. After having enough interest, she decided to start the Fort Walton Beach Junior Bombers Roller Derby team for ages 8-17. She began the team to provide young women with an avenue wherein they could belong, get healthy, and keep busy. The benefit isn’t just for the kids, though. The team takes responsibility for representing itself well. Not only will they help build a code of ethics in the kids, but they’re also there for the parents. Now in their second year, the Junior Bombers are still ramping up their numbers so that they can compete in bouts. A little nervous about this “rough” sport? Nicci made it clear that safety is always first and then went on to explain that the girls are taught how to fall, how to block, how to hit and even how to skate. That’s all before they’re even allowed to work with the team. When they do get to work with the team, the environment for trust and dependability is cultivated at every step. The best part about derby? It stays with you, Nicci says. Derby isn’t just for middle school or high school or college. You can play it the majority of your life and as you move, there’s usually a new team waiting for you.